NetCut works great on many type of networks like home LAN, office LAN, school LAN or even ISP LAN. Easy to use: One click to Protect user Computer Function!!! No one in the network can cut you off with ARP spoof technology anymore . Effective: one Click to Cut down any computer s network connection to the gateway. Note: The latest version supports Windows 7 both 32 and 64 bit. - actually, NetCut can harm you if you don't know what you're doing. 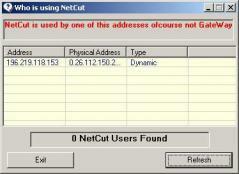 It allows other NetCut users to "mess" with you. NetCut is a fun tool and an useful program for some network admins. It's also a dangerous program that is used by some to fraudulently login on other people's PCs and mess with them. There's always an Anti-Netcut software if you're interested.